...This Die Cutting Tutorial will show you how to get the best from your dies. 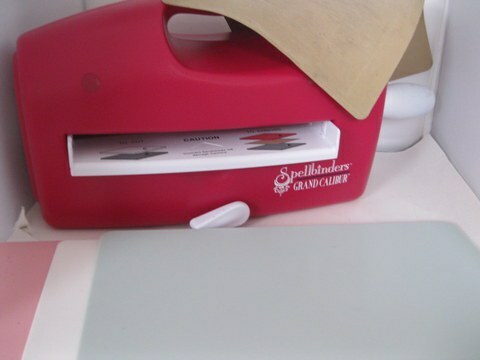 A Die cutting machine is a piece of equipment that most cardmakers and scrapbookers eventually decide to buy. There are many brands on the market in all price ranges and of course you will then need to buy the dies to go with it. Choose carefully and make sure you will get a lot of use from the machine and the basic die. This is one my personal choices and it is the Grand Calibur from Spellbinders. Spellbinders are some of the most popular dies on the market at the moment. And this is the machine that they brought out especially to use their dies. Of course they are a considered purchase as they are not cheap to buy. And I have added a video to tell you all about this particular machine. Grand Calibur Explained is just for you if you are new to cardmaking and looking to buy your first machine. The first Die Cutting Machine I bought, many years ago was the Big Shot from Sizzix. It has been a work horse that has given me good service and it has never let me down. Many people don't know how to make the most of these pieces and so don't get full value for money from their purchase that they can. This short video is made using the Big Shot as this is also a very popular make of die cutter. It will show you one of the ways in which you can get so much more from the dies and enhance your cardmaking. Try Matting and Layering from mirror card for a luxurious look, especially on cards for a wedding. Don't be afraid to experiment and play around with the dies you have in your collection. You will find the versatility of your Spellbinders is never ending and then they won't seem quite so expensive. Try using them to produce the Pyramage and the Invertage look to your cards for another way to make use of them. Look after them and they will last a lifetime giving you many years of wonderful cardmaking.